Something in me wanted to find out how far I could run without stopping. 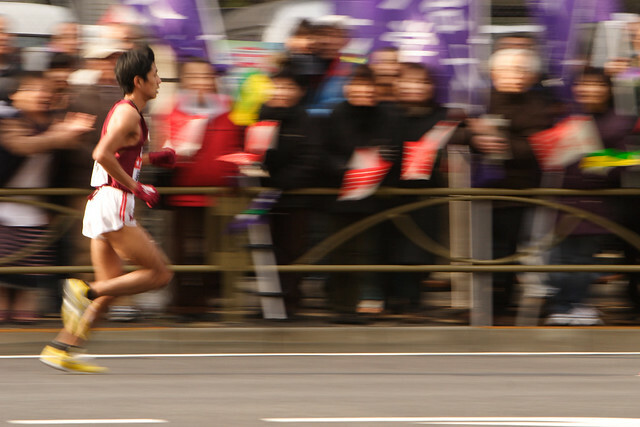 One of the new year events in Japan is the Hakone Ekiden. An ekiden is a long-distance relay road race. On 2 January the runners run to Hakone near Mount Fuji. On 3 January runners run from Hakone to Tokyo. The race is broadcast live on television over the two days. It is one of the most popular sports events in Japan. The idea of the word ekiden is like a stagecoach. The first ekiden was held in Japan in 1917 over 500 kilometres from Kyoto to Tokyo. The Yomiuri Shimbun newspaper sponsored the first ekiden race. Toki Zenmaro was a poet who worked at the Yomiuri Shimbun at the time and he used the word ekiden for the first time to describe a road race. Now the course is often a full marathon or a half marathon. In the Yomiuri newspaper recently there was an article about twins Haruka and Moe Kyuma. They are both great runners. They were members of the Tsukuba University women's team that was third at the 2012 All-Japan Women's College Ekiden Championship in October 2012. And in the 2012 men's Hakone Ekiden twins Yuta and Keita Shitara both ran for Toyo University. In the past twin brothers Shigeru and Takeshi So were famous Japanese marathon runners. They both competed at the Los Angeles Olympics in 1984. I wrote about DNA and family in budo/dna double helix. And I wrote about running in silent running. In Japanese you don't say my brother or my sister. You always put it in context. My younger brother or my younger sister. If you are watching a movie in English and one of the characters talks about a brother or sister without specifying older or younger the subtitle translator just guesses. The den in ekiden means transmission. It is the same letter used in densetsu, legend. And denki, biography. And hiden. Secret transmission.